Comedienne Kathy Griffin did not let Florida Democratic gubernatorial candidate Andrew Gillum's concession speech deter her from claiming Gillum actually won. The Tallahassee mayor conceded the race to Republican Ron DeSantis in a televised concession speech around 11 p.m. ET on election night. "We could not be prouder of the way we ran this race," a tearful Gillum told supporters. "We recognize that we didn’t win this tonight." But Griffin insisted on social media that Gillum actually didn't mean to concede, and that he would win in a recount and a runoff election. Every major media outlet has called the race for DeSantis, with 99 percent of precincts reporting. Moreover, Florida does not actually have runoff elections for gubernatorial races; DeSantis would only need a plurality of the vote to win. 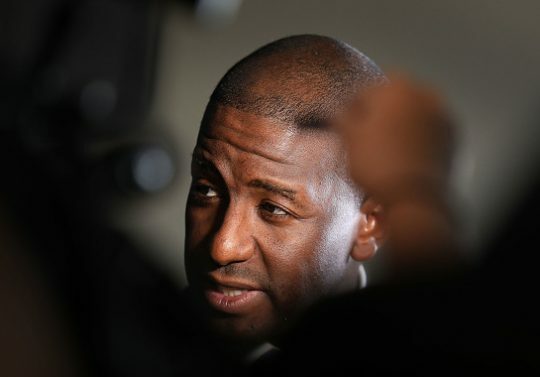 Griffin was not the only Gillum truther, with left-leaning journalists also tweeting that Gillum could still win. We think you can still win. Please consider announcing that you and your team are going to fight for every vote to be counted. This entry was posted in Politics and tagged 2018 Election, Andrew Gillum, Florida, Kathy Griffin, Ron DeSantis. Bookmark the permalink.